So it’s time to update the footing at your horse facility. After extending the life of your arena footing in your indoor for a few years now but the footing has reached the point where it is constantly dusty, uneven, and inconsistent. But what footing should you choose for your facility? Jumping Facilities: Jumping is the discipline that demands the most of the footing. The surface needs to be soft enough to absorb impact yet firm enough to be able to support the horse as it takes off for a jump. Sharp turns should also be able to be made without the horse slipping. TruStride footing is the perfect combination for jumpers. TruStride can be installed up to 6 inches deep without it having a “deep” feeling. Both the rubber and the fibers that help make up the footing, cushion the horse and rider when landing, yet offer a stable surface to take off. TruStride is our premium footing. Dressage: Although dressage does not demand as much from the footing as jumpers, a stable footing is still needed. Dressage riders want the footing to have a bit of “give” to it, while not being too deep. 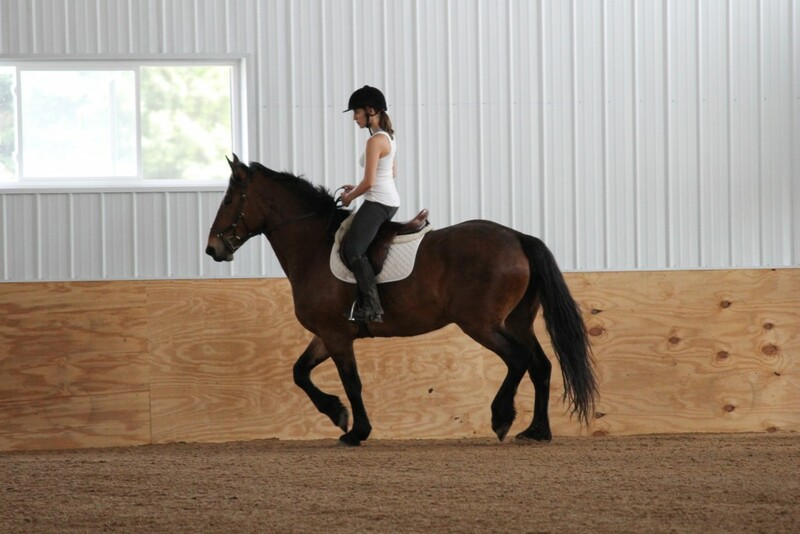 Traction is still needed when riding dressage so that the horse can do side passes easily without slipping through the footing. Our LiteStride and our Equi-Blend are great footing options for dressage riders. Both footings offer stability, traction and “give”; which is exactly what is needed for Dressage. Equi-Blend can work for a private dressage arena but if there are many dressage riders, we would recommend the LiteStride. Barrel Racing: Barrel Racing arena footings need to provide traction for the racers as they work around each barrel. Footing depth is set at around 4″ to allow for a bit of slide. Barrel racers have told us that they really enjoy our LiteStride arena footing. They said it has the perfect amount of grip and amount of slide that they’re looking for. Boarding Facility: Boarding facilities or lesson barns can be very tricky. Typically here you have many different disciplines riding in one area. A facility that has a range of disciplines needs a footing that can handle many horses a day and support the range of disciplines. Typically the boarding facilities that purchase from us purchase the LiteStride footing. LiteStride is a great all around footing that can handle jumping, dressage, barrel racing, groundwork and western pleasure. LiteStride works for almost all situations; however, if you have boarders that are jumping higher than 3 feet we would recommend you to get our TruStride, which provides more cushion when jumping. Of course all of our footings are dust-free. In addition to the footing supporting the horse properly, time spent maintaining the footing is significantly decreased. If you have more specific questions about what footing should go in your arena, please feel free to contact us!